Will all players who have entered our season-long competitions, please check for their opponents and play their games ASAP. Please don't leave it right until the deadline for eachround because you courts bookings are bound to be very difficult then. Our AC team got their season off to a solid start today ,shaing the spoils at Roehampon. 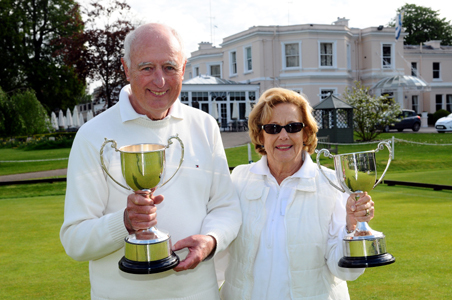 In the morning Chris Roberts and Frances Colman took a doubles tie, whilst Harry Midgley and Peter Honey were edged out by the hosts. And in that afternoon singles it was honours even again, with victories by Chris and Harry cancelled out by Roehampton in the other two rubbers. Harry Midgeley kept his cool to win the AC Barnses Cups Tournament today with novis partner Rosie Richardson. Following three block games the two block winners emerged for the final on a very chilly afternoon indeed. But despite some good 'hit ins' from Brain, it increasingly looked like a flawed plan as Harry and Rosie steadily clawed back the lead. Rosie scored the second of two weekend 'peels' to her great delight and in the end victory was assured by +3. Elsewhere in the field of eight pairs, Frances Colman again impressed and really is on a great run of form at the moment and looks set for another handicap reduction in no time at all. Of the novices, Raghu Iyer perhaps showed the greatest promise. 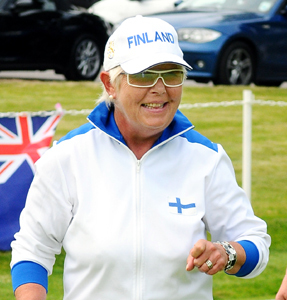 Pauline Wood, who like Raghu has just returned rom a Croquet Accademy training course, also showed a growing apreciation of the AC game and was 'Mrs Cool' in sinkinhg a pressure hoop shot for victory in her last game alongside Chris Roberts. Quote of the weekend was from Pauline: "Rosie and I are really enjoyning this and we think we like AC more than GC!" 9th May - Colin wins again! Colin Morgan won the Drawn Parners Tournament no.1 today and used the services of two parntners to pull off the vicory. John Kennedy thankfully 'made up the numbers' in the morning but had to leave as planned at lunchtime so Frances Colman took his place in the afternoon. Two more wins saw the 'partnership' end the day undefeated and win the champagne, but Frances sportingly donated her's back to the Club as her (cercumstances forced) paring with Colin was perhaps a little too strong. Ralph Chambers and Bruce Mason squeezed out Mike Fensome and for the runners-up spot as those remaining on a bitterly cold afternoon, headed for the bar . . .
10th May - Colin wins again! 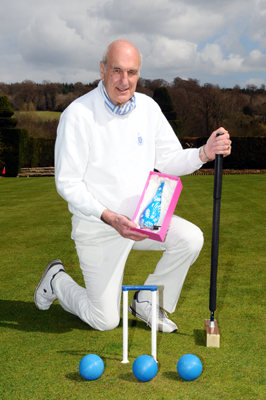 Colin Morgan takes his place in the National Charity One Ball Finals at Winchester today. He earned his place by winning the Phyllis Court heat two weeks ago. Good Luck Colin! Following the timely conclusion of the AC Barnses Cups Tournament yesterday, all four courts are available for members to book today. Courts 3 & 4 have been utalised over the weekend so far by members but now Courts 1 & 2 have been 'freed up' too. The atrocious weather made today's premier singles tournament the 'Open' (for the Blue Ball Trophy) a real trial but Helena Fensome battled through to win. The other star of the day was Mary Gaynor, who celebrated her handicap reduction (now 4) by defeating Helena in their block game, which was a real turn up. So the semis saw Chris Roberts, who had won the other block, meeting Helena a round earlier than the seedings had predicted. Chris never really got going and was soon 1-5 down through some silly missed clearences coupled to Helena's flawless shotmaking. Chris founght back to 5-6 but to no avail and Helena went into the final to face Mary, who had beated a 'surprised to be there' John Hale (what a fine performasnce by him) in the other semi. The final it's self was a dull affair lacking real incident and wrapped up this time by Helena. Chris Roberts will be the first name of our unique 'Black Ball' trophy following his vicory in today's Handicap Singles Tournament. Whilst some struggled with the 'extra turns' concept, Chris (who gave away 24 extra turns) was unbeaten throughout and fought of a sprited Ian Norris in the final.